In 1907 the Tampa Northern Railroad was built, connecting Tampa, through Stemper, towards Brooksville and beyond. Its construction effectively put the Concord Stagecoach Line out of business. The top of the Lutz depot can be seen at the right in this 1913 photo. The old wood-burning engines required frequent stops to take on more wood. These loading places became known as wood rack stops. 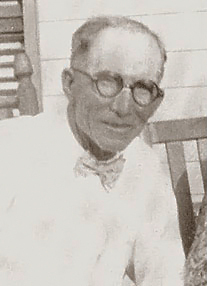 The wood stop just north of Stemper was named by early Tampa Northern engineer William P. Lutz; naming the station after himself. William was a young engineer from West Virginia and his brother Charles, ran a sawmill in the Odessa area. Charles Henry Lutz, at right, circa 1910's. 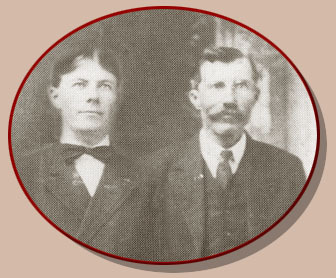 The young man on the left is his son, Clarence Lester Lutz. It's an edited photo taken from a 4-generation portrait here. Another wood stop about five miles north of Lutz Station, he named Denham in 1907 in honor of his fireman. Denham was located at present day US 41 and Hwy. 54 and encompassed an area within a one mile radius of the wood stop. A sawmill once stood where the recent U-Save grocery store used to be (now Big Lots.) Around the mill were workers' housing, a commissary, and the train depot. The dirt road from Denham to Dade City was known as the Denham-DC (now Hwy. 54). The community had no cemetery, school or church for many years. 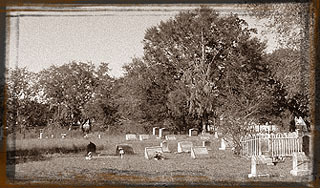 Part of Myrtle was in Pasco County, but the Myrtle church, school and cemetery (now County Line cemetery) were in Hillsborough County on the south side of County Line Road just east of Livingston Avenue. The church and school were on property adjacent to the cemetery. Jump to Myrtle's future past: In the 1930's when the one-room school at Myrtle became too crowded, the decision to build a larger, two-room structure was made. It was named Myrtle-Denham School and the 5 acres for the land was donated by Mike Riegler, early Lutz area settler. The school was located just east of US 41 at Hwy 54. It operated until 1948 when the Sanders Memorial School in Land O' Lakes was opened. The old school became a residence, then was torn down in 1997. Another settlement near present day Lutz was known as Nowatney and was located about 3 miles south of Stemper near present day Skipper Road. During the prohibition years, the area around Skipper Road was known for bootleggers. Nowatney had their own turpentine distillery. In between Stemper and Nowatney was Chapman, the area around where present day Interstate 275 crosses over Nebraska Avenue. The turpentine still at Nowatney, 1914. Located north of present day 131st Street, it later became the site of the Robbins Lumber Company.